Last week, the UN World Tourism Organization (UNWTO) held its 20th General Assembly in Victoria Falls, on the border of Zambia and Zimbabwe. Elections were held on the Secretary-General, half the members of the Executive Council, and members of Regional Councils. Chairs and vice-chairs were elected for the Executive and Regional Commissions as well. An invitation for nominations for Secretary General were sent to UNTWO member states in December 2012, a year before the end of incumbent Secretary General Taleb Rifai’s first term. Nominations were to be submitted before the 95th Meeting of the UNWTO Executive Council, which convened in May 2013. 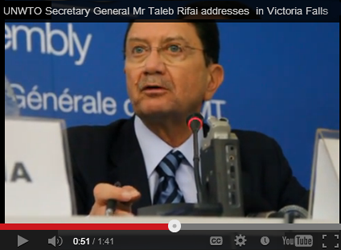 Taleb Rifai’s candidature was put forward again by Jordan, of which Mr. Rifai is a national. His was the only nomination, according to Zambia Tourism Minister Sylvia Masebo. The Executive Council unanimously voted to recommend Mr. Rifai for a second four-year term, running from 1 January 2014 through the end of 2017. As the sole candidate, he was re-elected by default by the General Assembly and took the oath of office on 28 August. The 20th General Assembly also elected several new members of the 32-member Executive Council, the UNWTO’s governing board. (Thirty-one Councilors each represent five full members of UNWTO, and Spain, as the host country, is a permanent member.) Council members are elected for four-year terms from regional groupings, with elections held for half the members occurring every two years during the General Assembly’s meeting. The Council also elected its chairs and vice chairs for the 2013-14 and 2014-2015 terms. Indonesia’s Deputy Minister for Tourism and Creative Economy, Sapta Nirwandar, will serve as chair from this October, with Jamaica’s tourism and entertainment minister, Dr. Wykeham McNeill, taking over next fall. Regional Commissions also elected chairs and vice-chairs, the most notable being the unanimous election of Zimbabwe as the chair for the UNWTO Regional Commission for Africa. Usually, it is the tourism minister representing the country at the UNWTO, but it is suspected that President Robert Mugabe will be more directly engaged in the role. The election of Zimbabwe is being decried as an endorsement of of Mugabe’s leadership. Zimbabwe had submitted in writing its desire to chair the Regional Commission for Africa prior to the start of the General Assembly meeting. 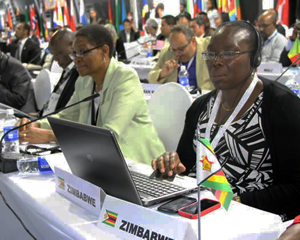 The nomination was made by its co-host Zambia and seconded by all 23 members of the Regional Commission for Africa. It is unclear if any other delegation expressed interest in the chairmanship. As President of the (co) hosting country, Mugabe was highly visible throughout the 20th General Assembly, provoking controversy by claiming other UNWTO Member States had tried to sabotage the event. It was not the first controversy surrounding this year’s Assembly. Both Canada and the UK pulled out of the event after Zimbabwe was selected as a co-host. Beyond lending legitimacy to his election in Zimbabwe, what impact Mugabe’s election as co-president of the General Assembly, given it meets only once every two years, is uncertain. The right to host the next Assembly, which will not occur until 2015, was won by Colombia in a heated contest against Cambodia, 60-38. Bonnie recently completed a M.A. in International Development, with a concentration in Cultural Economics, at the Josef Korbel School of International Studies at the University of Denver. She has lived and studied in France and worked in Morocco and Bosnia-Herzegovina. Prior to graduate school, she headed community outreach and education for a social services agency in Tucson, Arizona. She graduated with honors from Gonzaga University with a B.A. in International Studies and French. She currently works in non-profit administration in Washington, DC.